It's all too rare these days to see a progressive jackpot on a set of classic 3-reel slots with only a single payline. Click here to play! Too many progressive jackpot games require the player to jump through hoops and bet on 20 or even 100 paylines in order to have a chance at winning the top prize, and there are so many varying combinations that you need to refer to a chart if you want to work out how you got your prize! 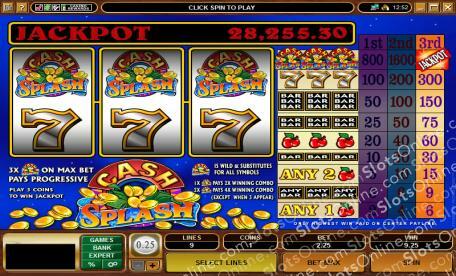 The Cash Splash 3-Reel slots don't follow the trend. With only three reels and just 1 payline, they have a fixed coin value and it only takes 3 coins to unlock the highest level of payouts. The top paying Cash Splash symbol is wild, and increases the payout when it substitutes, but that is as complex as these slots get. The rest of the symbols are simply cherries, BAR symbols and 7s, so you know exactly what you are getting when playing the Cash Splash 3-reel slots. For a truly classic slots experience with minimal fuss and a big progressive jackpot, be sure to give the Cash Splash 3-reel slots a whirl. The Cash Splash Logo symbol is wild, substituting for any other symbol. Wins that it acts as a substitute for receive double payouts when 1 wild symbol is used, and quadruple payouts when 2 wild symbols are used.